You've never so many green-eyed skulls before! This fantasy-style style sword is covered with them, and they are ready to stare down anything that crosses their path. 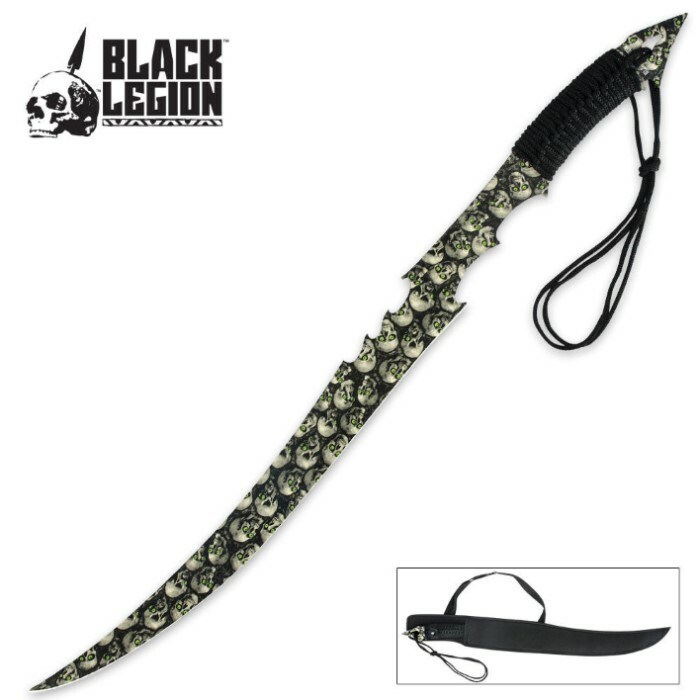 This sword utilizes hefty one-piece stainless steel construction with a baked-on green-eyed skull camo pattern that covers the sword in its entirety, from the pointy pommel to the piercing tip of the curved blade. A nylon cord wrapping generously encases the handle portion of the blade, giving you a sturdy grip with a lanyard. This 26" fantasy sword includes a custom nylon scabbard with a shoulder sling so you can wear it in true over-the-shoulder ninja fashion. I got it thinking it was going to be just another cheap sword, but i was proven wrong! the paint job looks amazing and it came sharper than anything else ive gotten from budk great job this time!